If you are a patient that’s suffered from tooth loss – due to decay, injury, gum disease, or infection – you understand that missing teeth is more than just missing teeth. You’ve lost an important part of who you are, and it can be difficult to live your life as you did before. Thankfully, at Grinview Smiles, we can replace what you’ve lost so you can get back to living your life – with a complete smile! A dental bridge is an oral appliance used to repair and replace missing and damaged teeth. If you have a gap in your smile, a bridge can fill that gap with fabricated teeth and be locked into place with the help of dental crowns on either side. 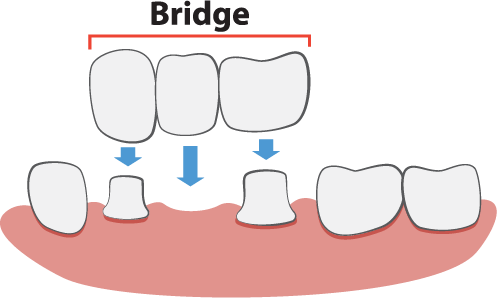 Bridges can either be fixed or permanent, or they can be removable or temporary, depending on your needs and desires. Bridges by your Grandview dentist, Dr. Michael Grier are expertly crafted from tooth colored porcelain, combining dentistry and artistry to create a beautiful and functional restoration to fit your needs. Our bridges are just as strong, durable, and natural looking as your own healthy teeth. If you’re ready to fill the gap in your smile with a custom dental bridge, you’ve come to the right place! If you have any questions about bridges or would like to schedule an appointment with your Grandview restorative dentist – Dr. Michael Grier at Grinview Smiles – give us a call today at (817) 866-2065.